Download a free printable protractor to accurately measure an angle. 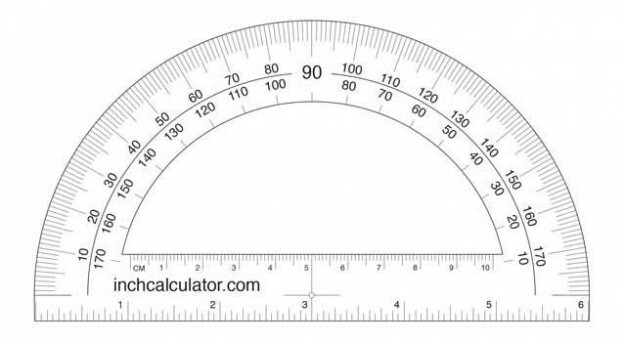 It’s a standard 6″ protractor with angle measurements in both directions to find inside and outside angles. It includes a 6″ and 10cm ruler and is completely disposable making it great for one-time use projects or projects requiring a flexibility or a bendable tool to wrap around angles. Offers precision down to 1 degree. Use heavy-weight paper or heavy card stock to get a more rigid protractor. This can make it last longer or keep it more rigid when needed. Use light-weight or standard printer paper to make the protractor more flexible. This can help the it bend around curves on a project. Check the accuracy of the protractor by measuring a dollar bill, it should measure just over 6″ and be the same size as the base. This is only needed to calibrate the rulers, the angle measurements wil work at any size. Use our degree unit conversion tool to convert the angle measurement from degrees to radians, mils, or grads. Find out how to use a protractor and learn tips and tricks for measuring angle. See our printable rulers or printable tape measure if you need to measure length.